A great way to stay in touch with what’s happening in the Microsoft space is to follow Sam Marraccini as he provides a fun perspective on what happens with EMC and Microsoft. It’s a significant amount of work for one person to do his day job and produce informative videos on Microsoft infrastructure-related technology. Nice work Sam! EMC works hand in hand with Microsoft to make sure our storage platforms are compliant with SMB 2.2 for platforms like the VNX and Isilon platforms. This entry was posted in Windows 8 on January 19, 2012 by Brian. (numbers last updated 5/30/13) Sometimes people ask hypothetical questions of EMC’s field TC’s (technical consultants) just to see what we say. Question: What is the maximum size of a LUN you can present to a Windows server? It’s all about the underlying addressing space of the disk and the filesystem you choose to create the volume that gets presented to the Windows server. I remember a time I could dial a five digit local phone number as in 5-1212 to reach local people. As the town grew, it extended to seven digits… 555-1212. Eventually this turned into a 10 digit string such as (123) 555-1212. We began using a larger addressing space. A better analogy is IPv6 which, although still in its infancy, is being put into place to provide a significantly larger “address space” for IP addresses. IPv4 (the current standard) allows 232 addresses. The new address space thus supports 2128 (about 3.4×1038) addresses and could eliminate the need for clunky workarounds like NAT. A typical IPv6 address looks like 2001:db8:cafe::1, compared to an IPv4 address 192.168.148.1. You can read more about IPv6 in its Wikipedia entry or in the free book, The Second Internet. You can use IPv6 tunnels if your ISP does not offer IPv6 connectivity yet. Using http://test-ipv6.com/, you can verify IPv6 connectivity. 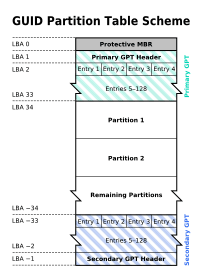 Master Boot Record (MBR) Disks have 32 bit address spaces. Both the partition length and partition start address are stored as 32-bit quantities. When the block size is 512 bytes (one sector in most cases), this implies that neither the maximum size of a partition nor the maximum start address (both in bytes) can exceed 232 × 512 bytes, or 2 TB. Alleviating this capacity limitation is one of the prime motivations for the development of the GUID Partition Table (GPT). GUID Partition Table (GPT) Disks are 64 bit or 264 × 512 bytes giving you much more room to grow. From a Windows persective, Windows Server 2003 SP1 introduced GPT support and has been carried forward since. FAT volumes have a maximum size of 4GB and a file size limit of 2GB. FAT32 file systems have a maximum volume size of 32GB with a file size limit of 4GB. NTFS volumes can be up to 2TB on an MBR disk and 16 Exabytes (EB) on GPT disks. The maximum size NTFS volume that has been tested by Microsoft is 16 TB. The maximum size of a VHD is 2040 GB (8 GB short of 2 TB). The maximum size of a VHDX is 64 TB. SCSI limitations. Microsoft Windows operating systems support two different SCSI standards when it comes to reads and writes (Read10/Write10 and Read16/Write16) , and each of this SCSI standards also have different lookup tables if you will. Read10/Write10 has room for 4 bytes of info (Max 2TB) and Read10/Write10 has room for 8 bytes of info with a max of about 8 zettabytes. This entry was posted in EMC, Windows 8, Windows Server 2008 R2 on February 21, 2009 by Brian.